Does your organization offer incentives for early renewal or flexible payment plan options? 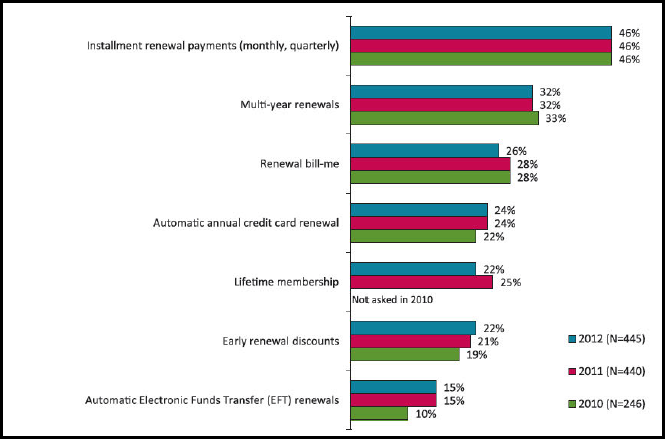 Earlier this month, we published some of the findings of our mini Membership Renewal Survey, in which we found that only 18% of the small membership organizations that participated offer incentives or payment plan options. So while larger associations are offering multi-year and installment payment options, perhaps smaller membership organizations should float these ideas with their members too? What about premiums and incentives? As we noted in our recently launched Membership Renewal Guide, some organizations that are on an annual or fixed schedule use contests and other incentives to prompt members to renew early and/or on time. Along with helping to speed the renewal process, sometimes a premium or incentive can tip the scale for those who are re-considering their renewal or choosing from among a number of association memberships. For example, recently a young colleague told me that she was considering discontinuing a professional association membership because of its high dues. But when the organization offered her a new monthly payment option as well as a premium (a book and subscription), she decided that she could manage the fee if it was spread out in monthly payments. She also noted that the book and subscription offer sealed the deal on her renewal decision. So if you are in the midst of summer planning for the upcoming membership year, consider whether offering fee payment options or incentives might be effective with your membership and whether you have the technical and human resources to make these options available. 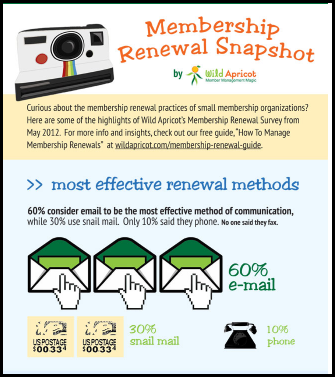 What renewal strategies are working for your organization? Let us know in the comments below.